Senior pics are so much fun. We love working with High School seniors. More than that we love creating art to portray who your children are, as well as how they perceive themselves. We send out questionnaires to all of our seniors to be. Its a chance to get to know each kid before we actually meet them. So when it comes to the day when we get to photograph the high schoolers we know what they like about themselves, what they dislike, the movies and music they enjoy, as well as what kind of scenery will be in each of their photography sessions. RC pictured here is one great football player. I wanted to capture awesomeness more than just a look at me photo. Something fierce, something that makes your jaw drop. The sun was setting and being spontaneous as I am, I came up with this idea from the top of my head. 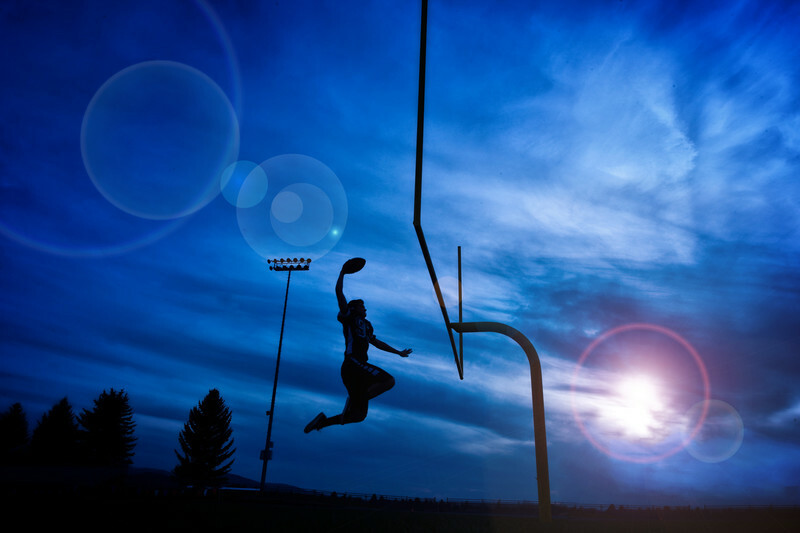 This images was taken at CHS, Cda High School on the football field. With the sky at a high contrast and RC "flying silhouette" through the air, I believe we captured just that. When it comes to having a local high school senior photographer capture who your kids truly are, look no further. Get in soon, as we book up super duper quick. Keywords: Lake City Senior Pictures (3).